I hope you all are having a great holiday! We just put the turkey in the oven, and I thought I would take a break to announce a Thanksgiving pattern sale. 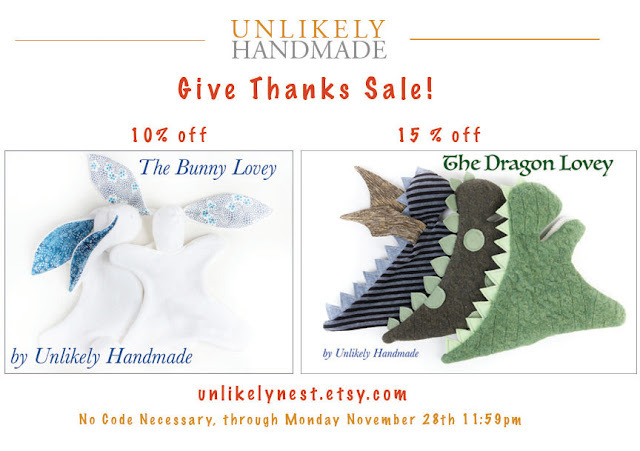 Thank you to everyone who has supported Unlikely Handmade in our first year! 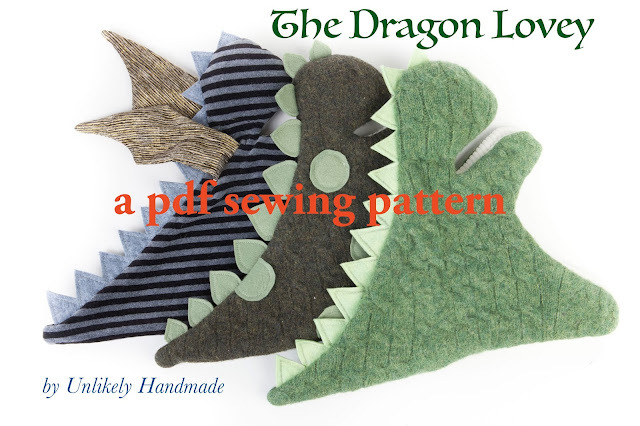 I am so pleased to introduce you to the newest sewing pattern from Unlikely Handmade... the Dragon Lovey! The Dragon Lovey is a pattern to make a blanket doll-- a soft toy that is mostly not stuffed, sort of like a shaped security blanket. The head is stuffed to give it a little shape, though! 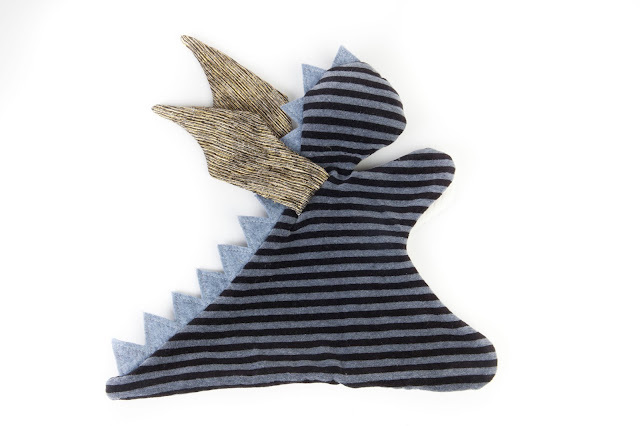 These toys are great gifts for newborns or infants, but they are also much loved by older children too! Dragon lovey made with a recycled, felted sweater, ribbed velour, and wool blend felt for the back ridge. The construction of the toy is very simple if you have basic sewing skills and a sewing machine. 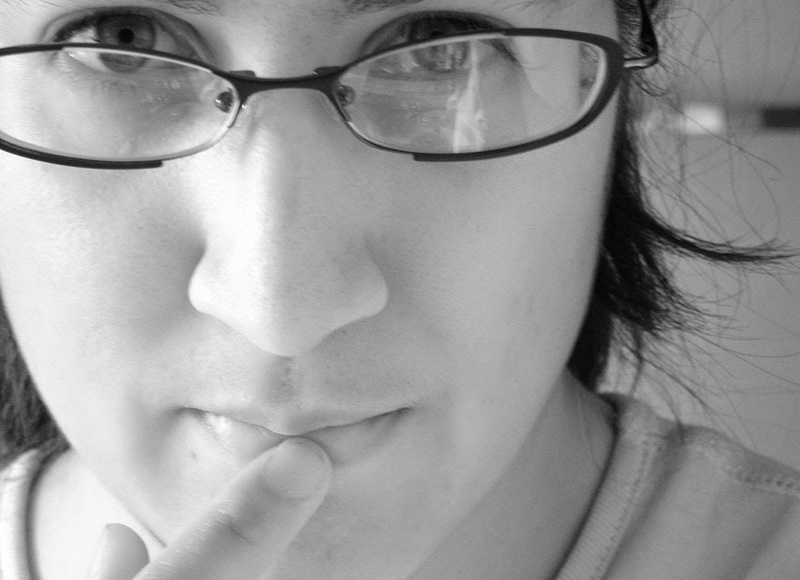 You could certainly do it by hand too, but it would take a bit more time. The pattern includes step-by-step instructions illustrated with photographs. The pattern also includes two fun variations. The first is a dinosaur... a Stegosaurus! 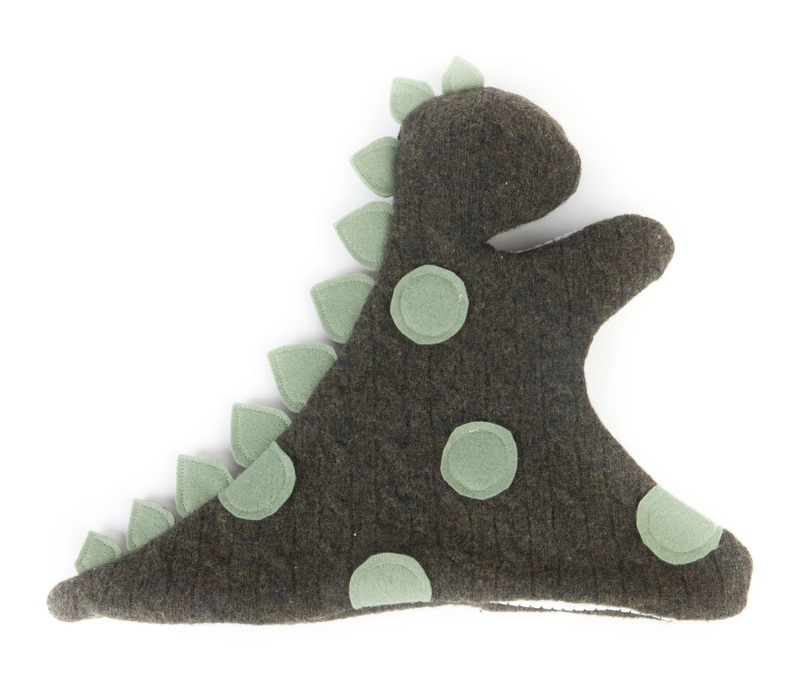 Dragon Lovey-- The Stegosaurus variation. This one is made from a recycled, felted sweater. The back ridge is wool-blend felt, and the belly is ridged velour. I added spots made from the same felt as the back ridge, sewn on before I sewed the body together. The second is a bit fantastical... a Winged Dragon! 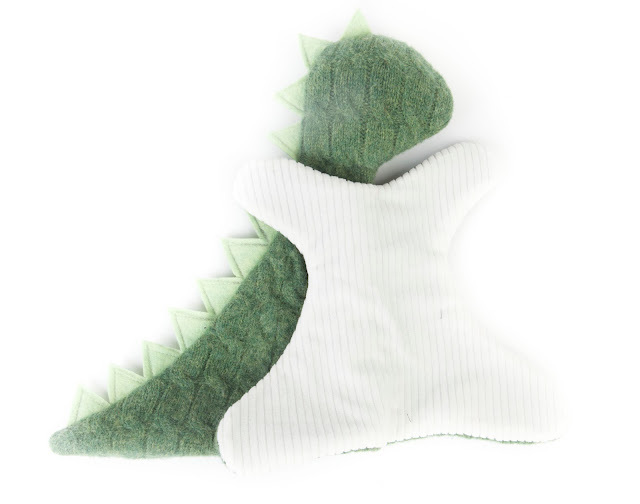 Dragon Lovey-- the Winged Dragon variation. It is made of striped velour, with a white velour belly. The back ridge is wool-blend felt, and the wings are shiny gold fabric from my stash, left over from a halloween costume! I wanted to launch this pattern in time for holiday gift making. Since it is hard to make just one, the purchase of the pattern also includes the rights to sell your handmade creations! To celebrate the launch of the pattern, the Dragon Lovey will be on sale until November 5th for 15% off (regular price $7). No coupon code necessary, just visit my Etsy shop. I love seeing your creations! If you make a Dragon Lovey (or Stego, or Winged Dragon), post them with the tag #dragonlovey and tag me @unlikelynest!